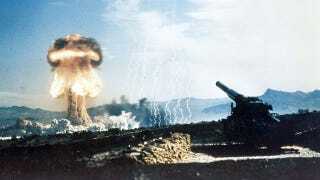 The fifties and sixties were a crazy time when it came to nuclear bombs. Half the population was trying to build shelters to get away from them, and half saw them as the wave of the future. Some of that second half came up with a great idea - nuke Canada for oil. The Athabasca Oil Sands are just northeast of Alberta, Canada. For an oil-hungry world, they're the ultimate frustration. Oil literally clings to the sand right on the surface. As it turns out, though, a slurry of sand and oil proves a tougher challenge to oil extractors than oil buried far underground. Manley Natland, a geologist working for an oil company, saw a lot of profit to be made in Athabasca, but no way to make it. One day he was working in Saudi Arabia and saw a brilliant red sun sink down in the sky until it looked like a giant explosion coming up from the ground - and he had an idea. That idea was in sync with the general drive to make nuclear weapons a solution instead of a problem. Operation Plowshare was underway, trying to make use of nukes. That project tested atomic bomb to see if they were fit for road construction, the making of artificial lakes, or the generation of hydroelectricity. Project Cauldron, also known as Project Oilsands, was a nifty little addition to the project. The idea was to set off as many as a hundred nuclear bombs under the oil sands. The bombs would heat the oil, making it easier to extract, and would create a sort of cavern underneath the sand to catch any oil that flowed down. Drilling and extraction should then be easy. Great idea, right? The United States Congress and Alberta's Federal Mines committee thought so. Residents living near Oilsands were not as enthusiastic. The nearest town was ten kilometers from the planned site of the first test. Although the town had only twelve residents, the people there made enough of a fuss to stall the test until the national and international mood shifted away from using nuclear weapons as construction equipment. Too bad. What harm could have come from setting off a bomb under a massive oil field? Via Why Not Nuke Alberta, CIM.